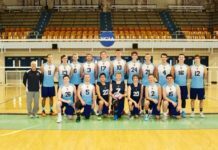 The University of Rhode Island women’s volleyball team remained undefeated in conference play following straight-set road victories over the weekend against George Mason University on Friday night and then George Washington University on Saturday to extend a five-game winning streak. 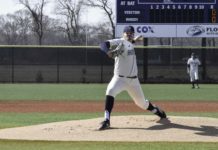 The Rams (9-7, 4-0) were intent on adding to their sweltering start in Atlantic 10 competition as they headed to Fairfax, Virginia to battle George Mason (4-12, 0-4) in a match-up that proved to be another anticlimactic, decisive win for URI. They pounced early, winning the first set 25-16 to set the tone, and then proceeded to take the next two both by a score of 25-20. Senior Audrey Castro and junior Marie Gillcrist led the team with seven kills each while A-10 Player of the week and senior Callan Kinnan collected her sixth double-double of the season with 29 assists and 14 digs. The team has been able to shut out their opponents due to their strong defense, which forced 27 Patriot turnovers to their 16, and a hitting percentage of just .011. Head coach Bob Schneck takes pride in their performance, but feels it is the team as a whole that has changed and improved. 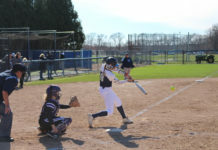 The Rams visited George Washington University (6-11, 0-4) on Saturday night, and for the fourth straight time swept their opponents by a competitive line of 25-23, 25-22 and 25-20. Castro again led the offensive attack with 14 kills to go along with 25 assists, while fellow senior Layne Self tallied a double-double of her own with 13 kills and 14 assists. Kinnan capped off a monumental weekend with a whopping 45 assists, which, made her the first URI player in the rally point era (the former sideout era only awarded teams points on their serve) to eclipse 4,000 assists in her career. The triumvirate of Kinnan, Castro and Self have laid the foundation for what they hope will be a prosperous final year at URI, one that Schneck knows will depend on the continued solid play of his senior class. The Rams’ recent surge will be tested in their next series of match-ups when they meet the class of the A-10 in reigning champions Dayton. Schneck feels that the team is both talented and deep enough to handle the big-game atmosphere, and knows a rowdy home crowd can make the difference in a highly anticipated weekend doubleheader. URI first hosts the Dayton Flyers, who went undefeated in conference play last season, (16-1, 3-0) on Friday at 7 p.m. in Keaney Gymnasium, and then looks to hold off an out-of-form, but always threatening Saint Louis squad (7-11, 2-1) the following night.